Cultural heritage, which includes archaeology, is recognized as serving an increasingly important role in European societal development. But what exactly is the relevance of archaeology to present day citizens? Imprint of Action investigates the sociocultural impact of archaeology through public activities. These activities provide an ideal setting for research, as they represent a structured point of encounter between the public and archaeological heritage; in analysing them, aspects of people’s connections to the past are revealed. As such this research forms an integral part of the NEARCH project (2013-2018). As a basis for analysis, survey data from three large-scale case studies – ‘DOMunder’ (Netherlands), ‘You(R) Archaeology’ (Cross-Europe), and ‘Invisible Monuments’ (Greece) was used. The analysis and interpretation of the case studies is based on a newly created methodological framework which finds its roots in the broader culture and arts sector. Results shows that activities encourage participation and interaction, which engenders sociocultural impacts on participants, most notably in knowledge increase, skill development, social relations, and happiness. 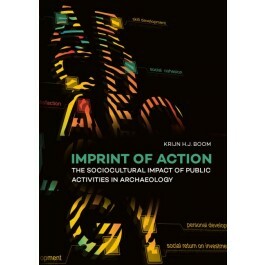 Imprint of Action is the first large-scale study focussing entirely on sociocultural impact in archaeology and, as such, is explorative in nature; it provides unique insights into the workings of interaction and participation in archaeological events, and openly shares qualitative and quantitative research data with the expanding field. In doing so, Imprint of Action lies the foundations for further analysis of the societal impact of both large-and small-scale heritage projects and identifies the incontestable values of archaeological heritage to the public.